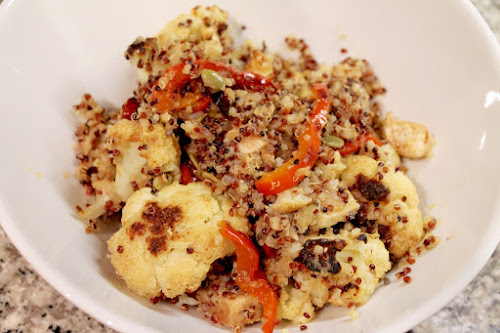 Cauliflower and quinoa have been "trendy" for years now, but that doesn't mean they aren't delicious. It certainly doesn't mean that they shouldn't be part of a good effort to eat healthier. The year is still pretty "new," so if you've resolved to eat better this year, a dish like this is a good place to start. 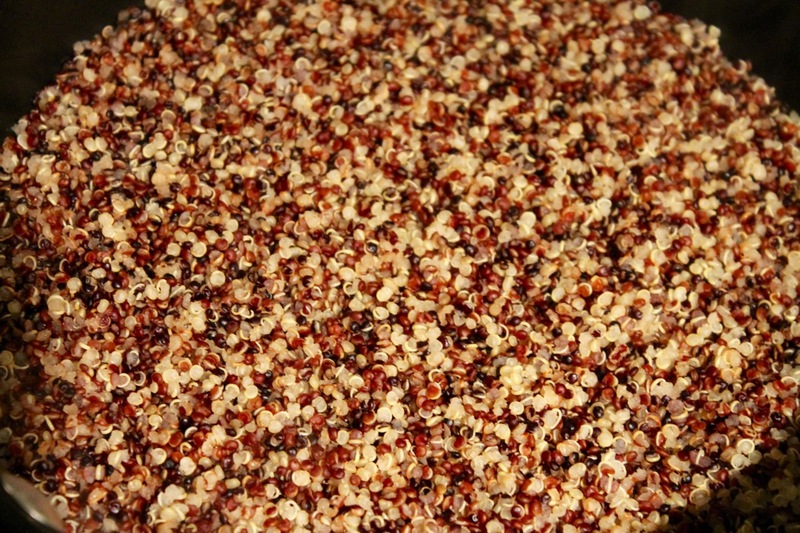 Despite how popular quinoa has been in recent years, it is, frankly, a little boring. 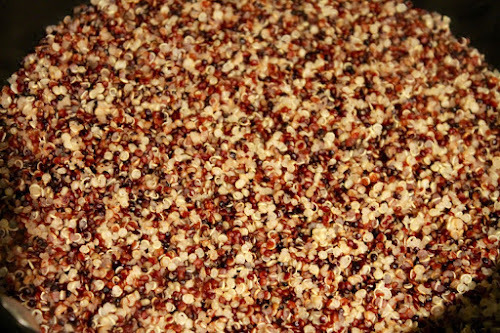 I do two things to make it more interesting: 1) I've been buying "rainbow" quinoa, a mix of white, red and black quinoa that makes the seed more visually striking, and 2) I toast my quinoa before I cook it, which gives it a nuttier flavor. 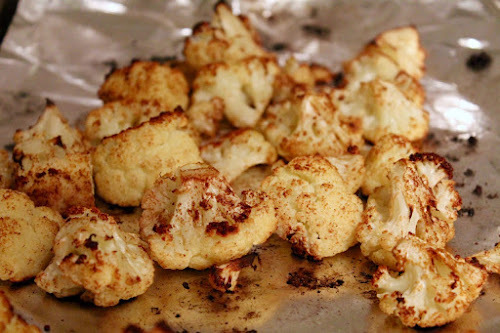 And roasting cauliflower is the best way to cook it. We enjoyed a wonderful side of it at Kat & Theo recently. It really takes away that slight bitter pungency and replaces it with someone wonderfully savory and slightly sweet. Beyond those two ingredients, this is a versatile dish you could prepare many ways. I went with chicken, red pepper and toasted pumpkin seeds and a good spice profile. The sauce of sautéed apple and onion pureed with lemon and honey adds a good rich sweetness without overpowering the ingredients. 1 1/4 cup water, plus 1 tbsp. 2. Toss cauliflower florets with 2 tbsp. olive oil, 1 tsp. ground cumin, a pinch of chipotle chili powder and salt, to taste. Spread in an even layer on a baking sheet lined with aluminum foil and roast until browned, about 30 minutes, tossing the florets a bit after the first 15 minutes. Remove from oven and set aside. 3. Set a medium saucepan over medium-high heat. Add the quinoa and toast until they quinoa pops and allow to pop for about 5 minutes, stirring occasionally. Add 1 cup water and bring to a simmer. Cover the pot, reduce heat to low, and simmer for about 18 minutes. Remove the pan from the heat and keep covered for another 10 minutes. Remove the lid and stir to fluff. Set aside. 4. Heat 2 tbsp. olive oil in a medium frying pan over medium heat. Add the chicken breasts, season with 1 tsp. ground cumin, a pinch of chipotle chili powder, a pinch of ground cloves and salt, to taste. Cook chicken until lightly browned, about 5 minutes, then turn over and continue cooking the other sides about 5 minutes. Remove the chicken from the pan, leave the oil and other drippings in the pan and increase heat to medium-high. To the remaining oil, add the onion and apple, season with salt and sauté until lightly browned, about 5-7 minutes. Set aside. 5. Heat 1 tbsp. olive oil in a medium frying pan over medium heat. Add the red pepper, season with salt and sauté until lightly browned, about 6-8 minutes. 6. Transfer the onion and apple mixture to a tall container. Add 1 tbsp. honey, 1 tbsp. water and 2 tbsp. lemon juice. Puree the mixture into a chunky puree using an immersion blender. Alternatively, transfer the ingredients to a food processor and pulse until it forms a chunky puree. 7. In a large bowl, combine the roasted cauliflower, cooked quinoa, sautéed chicken, sautéed bell peppers, apple-onion puree and pumpkin seeds. Stir to combine. Serve in large bowls topped with a squirt of sriracha (if desired).